A captivating Liverpool saga of love and friendship, perfect for fans of Katie Flynn and Catherine Cookson. When Rita Taylor is foisted upon her reluctant aunt, Margaret Sinclair, neither are happy. Rita didn’t even know she had an aunt, while Margaret is convinced her wayward niece will be nothing but trouble. Despite their differences the pair become unlikely allies in life and love, especially when Rita reintroduces Margaret to her long lost childhood sweetheart, William Brodie. 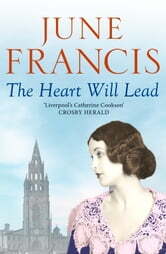 As Liverpool slips into the Great Depression, Rita’s relationship with the Brodie family flourishes and secrets from Margaret’s past emerge. But will hardship and heartbreak get in the way of this blossoming friendship? Originally published as ‘The Pawnbroker’s Niece’, The Heart Will Lead is a captivating saga perfect for fans of Pam Howes, Dilly Court and Lyn Andrews.